Fans of sports simulation games are tough to please. They demand the most realistic systems in their games, and woe unto the game that fails to deliver on that goal. That’s one of the most impressive aspects of Out Of The Park 14, actually, that it manages to cram so many different systems and complexities in and still get everything working correctly. 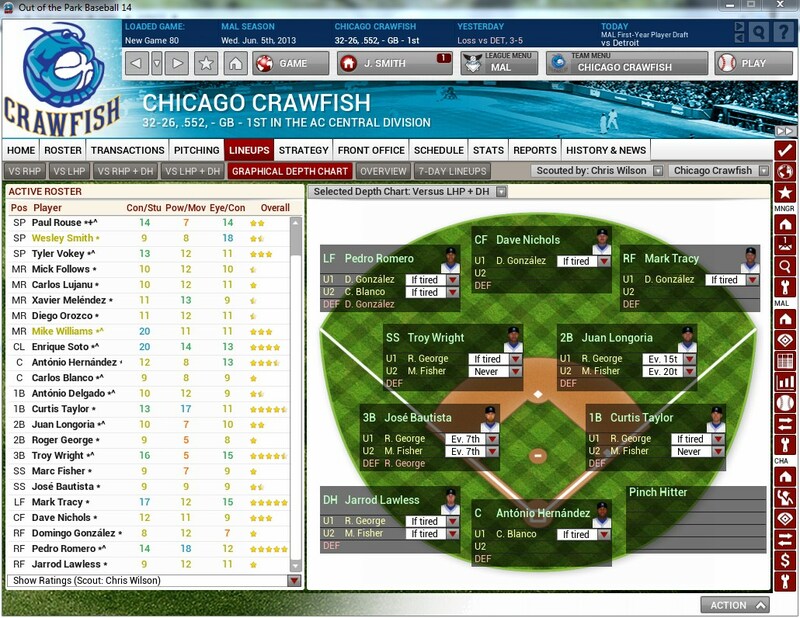 OOTP14 is a text-based simulation, so you don’t need fast reflexes or skills to succeed. All you need is knowledge, strategy and lots of time. You’ll need the time because once you get into the game, it’ll eat as much time up as you can give it. The great thing about OOT14 is that you can use it to simulate major league baseball in historically accurate detail for any era from 1871 to 2012, use the 2013 rosters and players down through every layer of the minors, or, if you’re tired of the American Major Leagues, you can play with the Dominican, Mexican, Korean or Japanese leagues, among others, or just play an entirely fictional league that you create from scratch, including all the rules endemic to a full league, such as drafts, minor leagues, free agency, arbitration, the works. If you want to play a historical league, you can lock it into following historically accurate player movement or you can let it go wild, creating such alternate histories as one in which Babe Ruth is never sold to the Yankees and the Braves become the predominant team of the 20th century. If you create a fictional league, there are tools available to customize every aspect of the league. Team names and locations, divisions, number of teams, even the financial structures of each team and of the league itself. If you don’t want it entirely fictional, you can draw off of existing leagues to create composite leagues, such as combining the Major Leagues with the Korean and Japanese leagues to create a truly worldwide league and make the World Series live up to its name. Of course, league creation is a minor part of the game, though one you can spend plenty of time on. Once you’ve got your desired league in place, it’s time to start playing! You can become the manager and GM of any team you want, major or minor, or even go onto the open job market and work your way up through the ranks. You can control as much or as little of the management of your team as you want, from every at bat of every game to the depth charts of each team under your control to drafting and which players to trade or sign or release. One thing to note when choosing a team, is that if you are the manager of a major league team, you are the GM for the entire organization, but when the manager of a minor league team, that is your only responsibility. Be aware though, that unless you turn the option off, you can be fired from any job for poor performance. Once you’ve got your job, you can go through the season as fast or as slow as you desire. Anything you don’t want to deal with, the AI will. The AI itself is fairly intelligent when it comes to comparison decisions for trades and signing decisions, but it occasionally fails to make intelligence decisions about releasing promising minor leaguers. The most enticing part of Out of the Park 14 is the fact that it is chock-full of just about every stat and information view you could ever want, yet rarely does it feel overwhelming. It can be hard to find exactly what you are looking for at times, but once you get used to how information is organized, it doesn’t take long at all. This, along with the generated stories throughout the season gives each league an organic, living feel. The customization, the historical accuracy, the ability to play with current rosters into an uncertain future, and the fact that everything plays out so realistically around you and your team are a testament to the strong base that Out of the Park has achieved over the years, and the newest entry does nothing but raise expectations for future years. Now, if you’ll excuse me, I need to get back to watching Joey Gallo destroy AA pitching for my Frisco Roughriders.